When I look back on four years of tracking Old St. Nick on Christmas Eve, I can't help but smile. The Santa tracker has really come a long way. I always thought NORAD's Santa Tracker was a great holiday tradition, but I felt like it could have been even better if people could visualize exactly where Santa was on Christmas Eve. So in 2004, shortly after Keyhole was acquired by Google, we followed Santa in the 'Keyhole Earth Viewer' — Google Earth's original name — and we called it the 'Keyhole Santa Radar.' The audience was relatively small since Keyhole was still a for-pay service at that point, and we hosted everything on a single machine shared with the Keyhole Community BBS server. We probably should have had 3 separate servers to host the Santa tracker - that first year, we had only a portion of a single machine. That night, about 25,000 people kept tabs on Santa and, needless to say, wreaked some havoc on our servers! Over the next two years, our Santa-tracking efforts improved dramatically. By December 2005, Keyhole had become Google Earth and our audience had become much, much larger. Our 'Santa Radar' team also grew: we used greatly improved icons from Dennis Hwang, the Google Doodler, and set up 20 machines to serve the tracking information. My colleague Michael Ashbridge took over the software and more than 250,000 people tracked Santa on Google Earth that Christmas Eve. In 2006, Google acquired SketchUp, a 3D modeling software that enabled us to include models of Santa's North Pole workshop and sleigh. We also incorporated a tracking feed directly from NORAD's headquarters, and we were now displaying NORAD's information in Google Earth. That night, more than a million people tracked Santa. 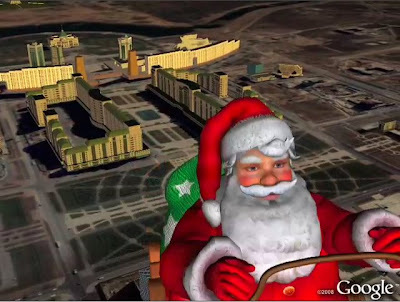 In 2007, Google became NORAD's official Santa Tracking technology partner and hosted www.noradsanta.org. In addition to tracking Santa in Google Earth, we added a Google Maps tracker and integrated YouTube videos into the journey as well. Now, we had Santa on the map and on 'Santa Cam' arriving in several different locations around the world, with commentary in six different languages. The heavy traffic — several millions of users — put Google's infrastructure to the test, but with some heroic work by our system reliability engineers, the Santa Tracker worked continuously. This year, Googler Bruno Bowden is in charge of the Santa software, and we have further upgraded our server capacity. We're hoping this version of the tracker will be the best yet. In addition to our Santa Cam footage, geo-located photos from Panoramio will be viewable in Google Maps for each of Santa's stops without a video. We've also included a few new ways to track Santa. With Google Maps for mobile, anyone can keep tabs on him from their mobile phones (just activate GMM and search for 'norad santa'). You can also receive updates from 'Bitz the Elf' on Twitter by following @noradsanta. And of course, be sure to visit www.noradsanta.org tomorrow morning at 6:00 am EST when Santa's journey begins.